Further to my pork stew soliloquy on meat from the reduced section of the supermarket, I had some minute steaks lurking in the freezer, marred by the yellow ‘reduced’ sticker which adorns many meats in the icy purgatory of the deep freeze, waiting for the day when they would finally meet their fate. Now, we don’t have minute steaks in the US – or rather, we probably do, but they are called something else – but I assumed from the name that they are for quick cooking which suited my purposes fine and for £1 I would’ve bought pretty much anything. A couple years ago I found this great recipe on epicurious which I have gone back to several times because the combination of flavors is just fantastic. I have done it as the recipe suggests, with fish, eggplant and bok choy – what the difference is between bok choy and pak choi is beyond me, apparently one has green stems and one has white stems, but who knows – and I’ve tried it with other meats and vegetables, so I knew it’d work really well with beef. You could probably dip a mud flap in this stuff and it would taste good. Whether it is even remotely Korean I’m not sure, but I am sure that it tastes darn good and, if I was Korean, I’d be glad to claim it. It’s a simple mixture of chili, soy sauce, vinegar, brown sugar and garlic cooked together until slightly reduced and a bit syrupy and then topped off with sesame oil. How could that possibly be bad? 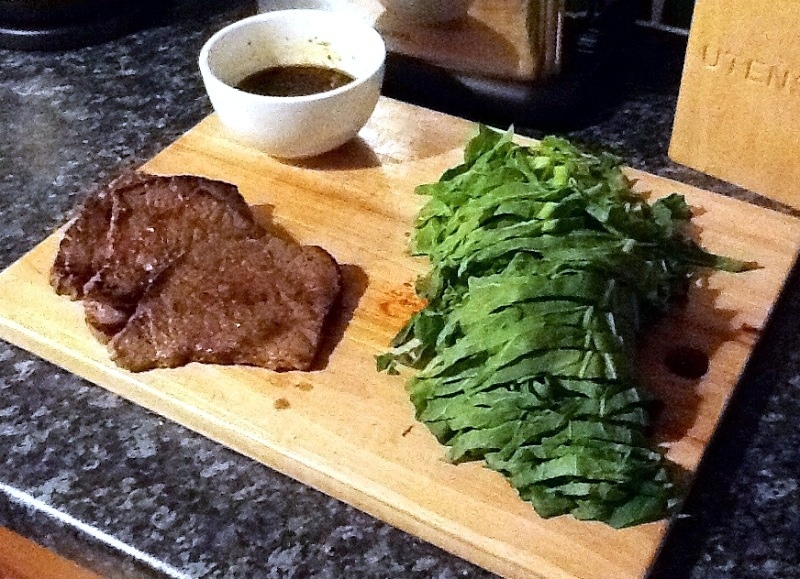 I asked someone who shall remain nameless to marinate the steaks when he got home from work about 4pm, but that person was far too busy to sit around loving steaks – I ask you – so the steaks stood, unloved, on the counter until I got home about 6pm by which time it was too late for marinating. However, marinating would be great if you can manage it. I plowed on regardless and seasoned the meat on both sides with salt, pepper and Chinese five spice and fried for one minute on each side. Now, you might be thinking that my math isn’t great and thanking your lucky stars I’m not doing your tax return or even counting your change at the corner store, and you’d probably be right. One plus one is two and, yes, they are called minute steaks not minutes steaks. In hindsight, 30 seconds each side would probably be better – and, yes, that adds up to one minute. Just make sure the pan is very, very, very hot so you still get some caramelization. In the small saucepan I had made the ‘barbecue’ sauce in, I added pearl barley and covered with water – why waste those lovely flavors of chili, soy and garlic? Whoever has produced the packaging is under the impression that cooking pearl barley on the stove takes 75 minutes. In what world of exponential time is that the case? Maybe I just eat it when it’s only one-third cooked, but it is perfectly lovely to me, and only the tiniest bit chewy, once it has soaked up enough liquid to cover it by about an inch which normally takes about 20 minutes. When that was done I tossed in about a third of the barbecue sauce and left that to sit and soak up some more flavor. Lastly, in the same wok I (over)cooked the meat in, I fried some ginger and chili and tossed in some shredded spring greens. After a couple minutes of stir frying, those were done and everything was ready to go! 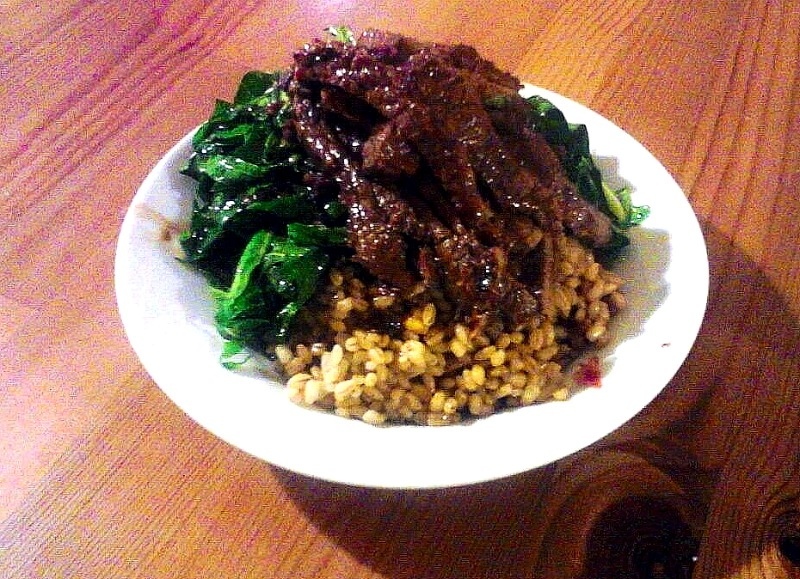 I sliced the steaks, which were perfectly moist and not too chewy, and served atop the pearl barley and greens and drizzled everything with the remaining barbecue sauce. It was a bowl full of loveliness which I would be happy to eat any night of the week. You’ve got to try this sauce on something – chicken, tofu, truck tire, anything! – I promise you won’t be disappointed. Oh, that looks really yummy!